You won’t find it in 1,000 Places to See Before You Die but David Hockney once described Dennis Severs House as “one of the world’s five greatest experiences” and who is to argue with David Hockney? I had heard the story of the house for years from my friend Laura who has visited countless times and was an acquaintance of the house's American owner and creator. The story goes like this. Dennis Severs, who moved to London from California as a young man, purchased a derelict house in Spitalfields, a then decidedly unfashionable and unsafe section of east London, and found his life’s work. 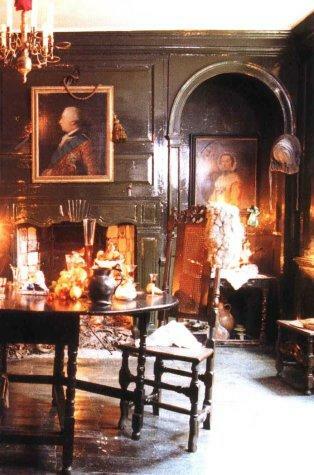 For thirty years, using an imaginary French Huguenot family of silk weavers as the residents, he created a house for them to live in as he imagined it would have been in the Georgian/Regency/Victorian era, depending on the room. And there he lived for 30 years, with the past, but without running water or electricity. Yes, that would have required a chamber pot. Fast forward to the 21st century and today's visitors are invited to participate in the imaginary family drama, sadly without the presence of Dennis Severs who died in 1999. The motto of the house sets the scene, “Either you get it, or you don’t.” As was explained to me at the doorstep of the house, “this is not a museum”. OK, I thought, so what is it? Much has been written about what Dennis Severs house is: a time capsule, a still life drama, a frame into a painting, a tableau vivant. On entering through the gas lit front door, this house is an opportunity to use all your senses to imagine the past. In each of the 10 candle lit rooms, the family's presence is felt by the still steaming cup of tea, the half eaten egg, the creaking floor boards, the sounds of clocks and carriages. There are the smells of family life: the pomanders, the damp laundry, the candles and the hearth fires. You can hear whispers, church bells and horses’ hooves on cobblestones. At the front door, you are instructed to be silent as you guide yourself through the series of rooms. Although I usually hate being told what to do, the silence enhanced the experience, creating the possibility of getting lost in another time. This is an experience where you can ease drop on the past in a completely non touristic way. It is, simply, fantastic. Don’t trust "1,000 Places", do believe David Hockney. Visiting the house takes about an hour but be sure to save time to wander through Spitalfields, named after the Hospital and Priory “St Mary’s Spital” founded in 1197. Spitalfields today describes itself as "quirky, historic, trend settingly modern, tatty and smart” and I think that about captures it. There are plenty of interesting buildings, interesting Londoners, a daily market and lots of stalls selling all kinds of food. Before my visit to the Dennis Severs House, I had lunch at the Arkansas Café which is rumoured to serve the best hamburger in London, but being a good southern girl, I had the barbeque pork sandwich. It ain't North Carolina, but for London, it was down-home delicious. The house is open every Monday evening (except holidays). Times vary according to the season. £12 Reservations required ALSO the 1st and 3rd Sunday of each month between 2- 5 PM £8 no reservations AND lunchtime between 12 – 2 PM on the Monday following the first and third Sunday. £5 no reservations . There is also a special Christmas Installation with additional opening times. Check the website.